These kinds of recipes are often the most popular on my site. With only a few ingredients, and minimal time to prep/cook, this dish will blow your socks off. Actually, this recipe was inspired by Ava. My little chef who won’t eat a blueberry or a strawberry, but will happily devour an entire pan of these Garlicky Sautéed Mushrooms. And honestly, I don’t blame her. They’re freaking delicious. Not only is this an amazing side dish for an easy weeknight meal, but these are a great addition to your Thanksgiving table because they take no time at all. I’ll be making them this year, and simply bringing all the prepped ingredients over to my sister-in-laws house and cooking these down for 5 minutes right before we serve. DONE. You could also make them at home and warm them up for 1 minute on the stove. Easiest thing ever. One thing to remember, if you’re making this for a crowd, you’ll need a lot of mushrooms. These babies cook way down, kinda like how an entire bag of spinach cooks down to almost nothing! And, feel free to use whatever mushrooms you like! I love to mix it up and use a variety because they’re so pretty and flavorful. You’re gonna love these. I can’t wait to see them in your kitchen! 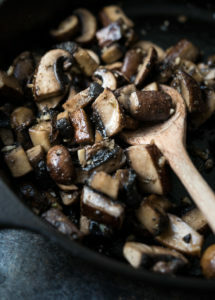 These Garlicky Sautéed Mushrooms have only a few ingredients and make the perfect easy weeknight side dish. They're bursting with flavor and come together in minutes. Preheat a large cast iron skillet or pan over medium high heat. Add the olive oil, mushrooms, salt, pepper and garlic powder. Cook for 3-5 minutes until mushrooms begin to soften. In the last minute of cooking add the minced garlic, stirring often. Remove from heat and serve immediately. In order to clean mushrooms DO NOT rinse under water. They will soak up all the liquid and become mushy. Simply get a paper towel damp, and gently wipe any dirt from each mushroom.